Thursday 23rd. October, 2014 – Job done! Friday 24th. October, 2014 – A short entry for a long day! After a great deal of time, I'm back! I hadn’t realised quite how long it had been since I last put something onto my webpage. There are no excuses: well, I have a few and I’ll start by trying to share some of them with you. I suppose that the hard slog of trying to put something on my blog each day just got too much for me and then I took on some additional responsibilities. 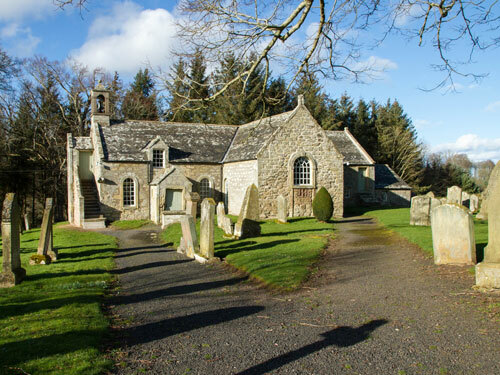 First, at the start of 2015, I agreed that I would become Clerk to the Presbytery of Duns for a one year period to allow the presbytery to have time to find a new, permanent clerk. That didn’t quite work out as planned and I am still Presbytery Clerk. Second, the presbytery planning process ran into a small problem which resulted in one tiny congregation requiring to be taken into the Guardianship of Presbytery. It required a minister (technically an interim moderator), there was no money available to pay one, I live close to the little village church and, as Clerk, I felt responsible. So in September 2016 I took on responsibility for looking after this tiny church. It has been fun and there will be more about this to come. The picture at the head of this entry is a picture of the church in question. It is called Fogo Parish Church and is extremely old. A notice at the church gate says that there has been worship here since the twelfth century and inside, the box-pews of ‘soon-after-the-reformation’ times are still used today. Third, I gradually settled down into a retired ‘elderly gentleman mode of living’. I took up playing golf (still not very well — but there will be more of this to come). I continued to watch cricket at Durham. With Rachel I attend the theatre at Berwick-upon-Tweed and quite regularly have set out for trips to the Globe in London or the Royal Shakespeare Company in Stratford-upon-Avon. We go for trips on Rachel’s narrow-boat and Tom and I are engaged in getting Olivebank ready (with a new outboard motor) to be launched at Amble Marina in Northumberland. Fourth, Tom and I are still working through our programme of building works at Mount Pleasant. Everything is going very much more slowly now that I have so many other Church responsibilities but we still hope to get everything completed before our bodies give out! At present we are working on the final phases of the Hen House — and there will be more of this to come as well. Finally, we have our four dogs and they take up a great deal of time. Mix, my rescue dog, is now thirteen and he has three sisters: Rowan and Daisy (both of whom are four and were born twenty minutes apart) and their sister Bramble who is two. You will hear much more of them if you continue to follow this web site. Rachel and I live in our converted granary, next to the farm house in which my mother, sister Olive and brother-in-law Digger live. We are a happy community — all of us content to be officially retired except for Rachel who is now running a kilt school with her friend Ann. The aim is to pass on the skills of traditional craft kilt-making and they all have a great deal of fun. So that’s where we are and I hope you will enjoy learning something of our adventures as the weeks go by.